Methadone Maintenance vs. Naltrexone: Which is Right for Me? What is the Treatment for Methadone Withdrawal? Is Inpatient Methadone Treatment Really Necessary? Do Children of Pregnant Methadone Maintenance Users Recover Well? How Do I Help My Friend While They Attend Methadone Treatment? Opiate Abuse During Pregnancy: Should I Go “Cold Turkey” or Enter Methadone Treatment? A methadone treatment plan is a comprehensive plan to help you get sober. If you are addicted to opiates and need help, methadone is one option for beating your addiction. According to the National Institute on Drug Abuse, methadone is a safe, effective way to stop abusing opiates. Before choosing a methadone treatment plan it is important to look at all of the ways that it can help you get sober. Methadone works by blocking opiates. The methadone portion of the treatment plan can help you get sober. 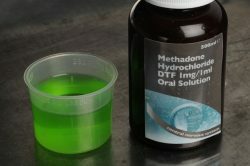 Although other plan components are important, the methadone plays a vital role in your sobriety. It blocks opiates. Methadone replaces opiates in the opiates at the opioid receptors. This stops the adverse effects of the opiates. It also helps to reverse the damage done, while you were taking opiates. It stops cravings, the same action that blocks the opiates also stops the cravings for opiates. Since it is taking up the opiate’s place at the receptors, it stops you from wanting more of the opiate drugs. Cravings are one of the number one causes of relapses. It replaces the feeling of taking a drug. Some people get high because they like to feel like they are taking something. It is a psychological effect on them. They feel that it accomplishes the same thing as the opiate does. It stops withdrawal. The blocking action also stops the withdrawal symptoms. Many people fear going through withdrawal because of the severity of the symptoms, by blocking the withdrawal, it allows people to taper down without feeling the adverse reaction. It has less visible effects. When you are on methadone, no one has to know that you are taking it. Since you are not taking a harsh illegal opiate, your health will improve and you will be able to function close to normally. Many people report that they feel better on methadone than when they were taking the opiate. It is legal. When you have a prescription for methadone, you do not have to worry about possessing illegal opiates. Since the methadone is taking the place of the opiate, there is no need to purchase opiates illegally. If you have a prescription, you do not have to worry about arrest. If you have a prescription for methadone and it is the pill form, you can have it on you and not worry about a possession charge if you are stopped by the police. As long as you do not drive on it you do not have to worry about DUI. Driving while on an opiate or methadone is not a good idea until you know how it affects you. You will be less likely to be driving if you are not illegally taking the methadone. Courts might order it as drug treatment. There is a possibility that the courts will dictate a methadone treatment plan as part of your rehab. If they do, following the whole plan will make it easier for you to get sober. It is a legitimate medication. Methadone unlike illegal prescription drugs or opiates, is a legal medication if it is prescribed to you. You will no longer be getting the pain medication you need illegally. Methadone along with a treatment plan helps you remain sober by treating the person as well as the addiction. With a treatment plan you will receive counseling for your addiction. Counseling is an integral part of opiate addiction treatment. They can help you deal with the triggers and other issues that happen when you feel you are going to relapse. Group counseling is part of a good methadone treatment plan. Group counseling allows you to share your story with others who understand. Most people who go to group counseling feel better knowing that there are others out there with the same problems. You will see a doctor daily at first. Seeing a doctor daily helps them evaluate you and troubleshoot any problems that you might have before they become worse. You will meet others with your issue. At the rehab, you will meet people who also have problems with drugs. It is good to know you are not alone. Just knowing that can help you stay sober and avoid relapse. It will help you discover the cause of the drug addiction. When you discover the cause of the addiction, you can learn techniques to solve it. This helps you keep from winding up in the same situation over again. Most people who change the cause of the addiction, do not relapse. Counseling will help you deal with both the cause of the addiction as well as deal with the issues the addiction caused. Counseling can teach you to deal with your problems in a constructive manner. This keeps you sober and healthy. It can also help you mend relationships that were broken while you were under the influence of the drugs. You will no longer have to deal with the cycle of getting drugs, using drugs, and acquiring more drugs. According to the National Library of Medicine, methadone is not without its risks. There is a risk of addiction, if you take methadone without a prescription or take more than prescribed, it can be very dangerous. It is important to consult a rehab specialist before undertaking methadone treatment. If you need more information, call us at: 1-800-530-0431. We can help.